As I did with my hand surgery, I thought I’d describe a little about my ankle surgery, for the curious and so people who find this post via Google can have some idea of what to expect. To begin at the beginning: Around 2008, I first started getting pain on the top of my foot, right by the ankle. This was about after I ran the New Jersey Marathon; at first I thought it was related to that, and then I figured it was related to Bikram yoga, which I was just getting into. I saw a podiatrist who prescribed me with orthotics, but they didn’t seem to do much good. I took it easy on the running and eventually it seemed like my foot was fine. I can’t really remember if the pain popped up again in 2009, but I know in early 2010 it popped up again. 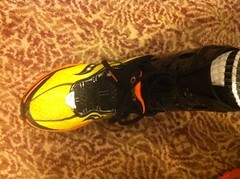 It would just hurt to run or have my ankle in plantarflexion (toes pointed downward, like when you step on the gas). Sitting on my ankle in yoga class was a little painful, and I couldn’t even anchor my feet while doing situps because the right one was too sore. On the worst days it even hurt to walk more than a few blocks. I got an X-ray from my primary care physician, thinking it might have been a stress fracture, but that wasn’t it. This time I was determined to get well, so I stopped running for a month to let myself heal. I had twisted my ankle while running a few months before, so I thought it was maybe related to that. (Although this bout of soreness didn’t start until a few months after I sprained it). I got into SoulCycle, spinning at New York Sports Club and using a rowing machine. I also got a Strassburg sock to try to stretch out my foot as I slept. Eventually I started running again and it seemed like all was well. But no — in yoga class in the summer 2011, I felt a twinge and it seemed like I had tweaked it. Sure enough I was sore for a few weeks after that, including walking. I could go for a run okay, but then would be limping for hours after that. It seemed ridiculous I had had this problem for so long. While googling I came across a description of anterior ankle impingement syndrome: Limited range of motion in the ankle. Check. The ankle may feel weak, “like it can’t be trusted to hold steady during routine activities.” Check. Common in distance runners; there may be a history of twisting ankle injuries. Check. This must be what I had! I posted a note on Facebook to ask if anyone had any experience with this; no one responded but someone recommended a foot doctor he said was good. I saw the doc, announcing to him that I was sure as my diagnosis. “Well, all right then,” he joked, making as if to leave. But after he took an X-ray he had to agree with me — I was right! He advised against surgery, though, saying that there were a lot of different tendons in the foot and surgery could be “messy.” Instead he recommended a just general physical therapy and treatment with some ultrasound device. I did that, and it seemed like it made it better — but a chance conversation with a ballet dancer after my yoga class made me think more about surgery. She had had THREE ankle impingement surgeries — posterior ankle impingement is fairly common in ballet dancers, who dance en pointe — and described it as not so bad. And I didn’t really leave my apartment for about 50 hours afterward, except to get my mail. But after having the surgery Monday morning I did feel good enough to go to the movies Wednesday night. We got crutches at a drugstore ($44, not much cheaper than the $50 hospital would have charged us), but I hardly used them. Just really for getting my mail Tuesday. 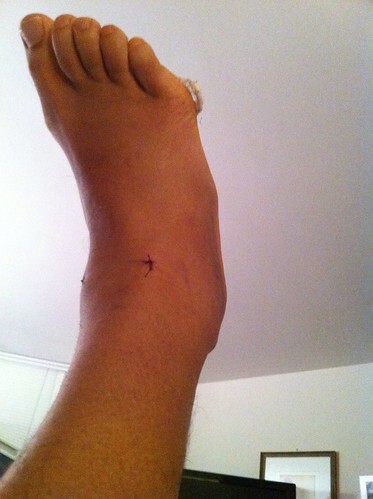 It wasn’t like a sprain where I couldn’t put weight on my ankle… I could, it was just swollen and sore. Very swollen! As you can see. I did my best to keep it elevated and ice it. The pain was not so bad, especially compared to my hand surgery. Actually what hurt worse was at the injection site from my anesthesia… I had the opportunity to choose either general anesthesia or a spinal block, which I guess is kinda like an epidural. I chose the latter, but jeez the base of my spine ached for a few days afterwards. And it was sorta hard to pee (Both common side effects). But I guess with general anesthesia you have to have a tube down your throat, which can make it sore, so maybe it’s a question of picking your poison. Four days after my surgery (the Thursday) I went back to my doctor … the nurse was a little surprised I had taken the wrap off my foot myself, so maybe I shouldn’t have done that. He told me the surgery was a success and he had cleared out the bone spurs as well as removed a loose piece of bone the size of a Tic-Tac in my ankle. Yikes. They gave me a lace-up ankle brace (like this one) to wear, which wasn’t so bad, offering support and helping to keep the swelling down. I could walk on it okay, maybe with a bit of a limp. I went back to work on the Friday, but could have gone earlier. And a week and a half after the surgery I did Bikram yoga — it went okay, although the ankle was definitely tender and not very very strong. Fifteen days after my surgery I even tried to run on it, in the brace. I got about a mile and a half…but decided maybe it wasn’t such a good idea. But this weekend — nearly three weeks post-surgery — I ran about four miles both Saturday and Sunday, without the brace, and it seemed fine. My ankle was tender, but okay. I will see Dr. Mroczek again on Tuesday to get the stitches out. So far it is too early to say whether the surgery will have made my ankle better — but it hasn’t been an awful ordeal, either. how did you go with this? i’m looking into the same surgery. I don’t really understand the question — I just wrote 1,200 words on how the surgery went, did you read them? If you’re asking for an update — my surgeon thought I was “crazy” for running on my ankle so soon afterward and told me I should wait six weeks until after the surgery. Which was yesterday, actually. But I kinda ignored him and have been running on it once a week. My ankle is tender/uncomfortable when I run on it (I wouldn’t use the word “painful,” tho) and during some yoga poses, like when I sit on my heels. But it seems to be getting better. The swelling seems gone or almost gone and the wounds from the (small) surgical incisions are scarring over. I just got the same surgery about a week ago, I’m just curious what’s the update on your ankle. Whether if your back to 100%, if your range of motion is improved, and etc..
Hey Jay, it is slowly getting better. I mean, it’s fine for most things. During yoga and doing weighted squats it can still feel funny. Also I’ve had some problems with my Achille’s tendon, it can be sore and tender at times, but I’m not sure if that’s related or not. Yeah Im excited to get back to playing basketball. One more thing tho umm after just a few days of the surgery I started walking on it only because itfelt like i could bear weight on it with no pain which I wish I hadn’t done due to the possibility of messing up the healing process. By a chance did you due this as well since you took off this annoying splint cast early? I started walking on it early as well. Like I said I really didn’t use the crutches, except for the day after the surgery. The nurses told me there was no prohibition against putting weight on it. Thanks for posting this…I’m going into the similar surgery in two days. They say I’ve got a bone spur on my talus that’s grating on the soft tissue above…so they’ll shave it down with the scope and clean up the joint. I’m a runner as well, so I’m curious to see how your progress is going? Have you been able to get back to your normal mileage yet? The surgery seems to have fixed the painful pinching sensation that had me limping sometimes after my runs, and sometimes made it painful to walk for a bit. (I don’t know if I am back to my “normal mileage” but that’s probably just because I’ve been doing more yoga lately. I’ve been running 10-15 miles a week). That said — I can’t say that the surgery has cured all that is wrong with my ankle. I still have a weird clicking sound in my ankle where the tendon snaps over the ankle bone sometimes … it’s called peroneal tendon subluxation and you can see a YouTube video of someone doing this here. I still don’t have a full range of motion in my ankle when it comes to dorsiflexion (flexing foot toward my shin). My foot still has a tendency to turn out quite a bit that I don’t have in my other foot. And it is still a tiny bit tender when it comes to sitting on my heels, although much less so than before. All this said: None of these issues are enough to stop me from running, like the ankle impingement syndrome did. I slept using a Strassburg sock for a bit and that seemed to take care of the tightness in my Achilles. Thanks for the reply. I’m looking forward for the recovery to begin. Did any of these additional ankle problems occur post-surgery or were they pre-existing conditions? My ankle is at maybe 70% right now, so I am getting the surgery partially to get that percentage higher, but also as a preventative for problems in the future. (Cuz as you know, it’s quite painful!) Obviously everyone’s recovery will be different, but it’s nice to read a personal account of a somewhat decent experience. Thanks so much for telling us about your story! I, too, am/was a runner, suffered a severe grade 3 sprain last summer, and am planning for my ‘scope soon. Out of curiosity and clarification, how soon did you experience the pain that prevented you from running (pre-surgery)? Did you have pain on immediate onset while you were running or did the pain eventually build-up a few hours after you stopped activity? Also, who was the original doctor that the ballerina recommended you to? Thanks for the cool and very detailed overview on your trials and tribulations with surgery. Helps those of us in the industry to understand the other side of the coin a lot better. I was curious if you’ve since tried any supports specifically for the achilles since your surgery? Bauerfeind is a German company that makes a few products for it (MalleoTrain, AchilloTrain) and we hear a lot of good things about it. Just haven’t heard a lot of post-op stories about using them and success or failure with them. Hey. So to answer some questions. It seemed like my ankle subluxation (tendon clicking over ankle bone) and achilles pain got worse after the surgery. That may be because, y’know, post-surgery my foot was all swollen up. The subluxation seems to have gotten better, but achilles pain is still there when I run. But the surgery seems to have fixed what I had the operation for — pain on the front of my foot. I should also point out: Dr. Mroczek actually asked me, before the surgery, if I ever had pain in the back of my ankle. I told him no!!! I guess there was something on the MRI that he had seen. I regret not having a more detailed conversation with him about it. At the time, I couldn’t really remember having ankle pain behind my foot… but now I do have it, sometimes. . I recently went to a different doctor and had X-rays. Sure enough there is something out of whack with the bone at the back of my foot, there is a fragment loose or something, and it is causing tendonitis in my achilles tendon. So he has prescribed physical therapy. I have not tried the MalleoTrain or AchilloTrain products; I did get a night splint but it doesn’t seem to help. Yvonne, it seemed like pre-surgery the pain was mostly AFTER I ran. Like I would be limping sometimes. I wish I could remember the name of the original doctor the ballerina mentioned, but I can’t. It was over a year ago now. Did you go to any PT or Message Therapists to help remove scar tissue? I just underwent an ankle arthoscope but also an incision was made to remove an osteochondroma growth that occurred near my talus. 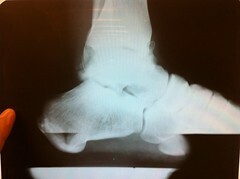 My doctor gave me an x-ray of the ankle after he removed the osteochondroma which was causing the ankle impingement. I am just curious what to expect once the cast and stitches are taken off. Hi there, I realize this comment is many many months after you wrote your post but I am really thinking about having this surgery soon. I have (self diagnosed right now but am 100% sure) anterior impingement in my ankle as well. I saw the spur on the MRI last summer but put off the surgery because the Dr at the time told me it was a 4 to 6 month healing process (and I had a newborn). However, since then, I’ve been told about the arthoscopic method and now am seriously looking into it (I have a consult in a week). I am worried about the time off but right now, having the surgery to have pain free runs (mostly post run pain) is high on my list. Just curious how you are doing now? I have a half marathon (road) late Sepetember that is already paid for but honestly I kind of want to get this sugery over with so I can do a December Marathon. I also run trails which is where I think my problem orginially occurred. D Rat – No, I didn’t go to any PT or massage therapists at first. 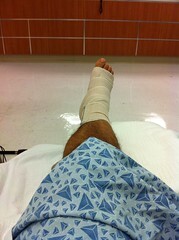 Eventually I felt like I had some more problems with that ankle and I went to another surgeon and he had me go to PT. But that pain was in a different area of my ankle, if that makes any sense. I feel like maybe there is still some bits of bone floating around in that ankle, and the surgeon only got some of them? Trailmomma – I’m doing fine. I still don’t have GREAT mobility in my right ankle. It’s noticeable when I’m doing yoga and weightlifting – I just can’t squat down very deep or flex my foot back towards my leg very far. But for everyday things, my ankle is fine. For running, my ankle is fine. It was a long time ago now at this point, but I’m sure my recovery time was not four to six months. Molly – Yup, still running. I guess my big regret is that I didn’t encourage my surgeon to be more aggressive in cleaning out all the little bits of bone? Maybe it would have meant a longer recovery time, but hey, I have to get by on this ankle for the rest of my life…. I can’t say I would “recommend” the surgery; I feel like everybody has different experiences and whatever. For me it was the right choice however. Thank you Derek for your updates your story is almost exactly as mine. But in saying that they months after surgery the impingement have come back and are now a lot more serve. Not sure if i have just tweaked.Hoping rest might settle it down. Wow. Your xray looks much worse than mine. Mine just showed “joint narrowing” at the front and cysts relatively throughout. I went with a distraction procedure involving months in a fixator. I do believe this helped greatly and allowed me to begin running after 2 years. However, now I’m getting fed up with the lack of ROM in the front. My MRI looks very much like yours, with the little bits of irritated bone protruding out on the tibia and talus. I’m going in for surgery on this this month with an estimated recovery of “3-4 weeks”. Is this reasonable and is it better to stay off it longer rather than pushing through? What is your current status and did they ever clean out the rest? Thanks.